Through the winter and spring months this past year we have been thankful to be involved in many different English clubs and classes. Two of the English clubs and one class are held in the nearby city of Beregszasz. One afternoon/evening a week we spent in the city teaching a university class at the local Rakoczi Ferenc Hungarian College and holding a children’s English club and an evening English club for teenagers and adults. The children’s club is focused more on English learning using games, crafts, and activities. The adult club is focused on a weekly topic that we discuss. The college class is also centered around a weekly topic of the English langua ge or American culture. It was a rewarding experience to get to know so many people through these weekly meetings. The classes gave us an opportunity to invite the students to other events. Many of the university students would later accept our invitation and join us in the late spring for a Bible retreat weekend in the mountains. 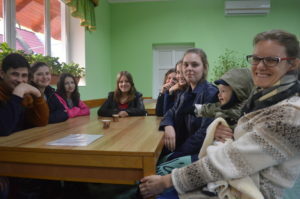 We also enjoyed teaching English in our home village of Peterfalva. We conducted English classes at the local Hungarian Reformed boarding school on a weekly basis. Most classes took place at the school learn ing about English through a variety of ways and methods. Classes often involved games, songs, and activities. One particular English class the Stacey and I reflected fondly on was one afternoon, when students came to our house to learn about American style pancakes and maple syrup. Pancakes are different in Europe. They are not the thick fluffy pancakes that dot the breakfast tables and cafes across North America. On the contrary, a European pancake is thin, cooked without a rising agent and is then rolled into a burrito shape with its delicious ingredients inside. In Hungarian cuisine pancakes are filled with chocolate, jams, or a type of local cheese curds. However, I have had similar pancakes in the Netherlands that were variety and could be filled with cheese and ham. Most people in Eastern Europe have never seen or tasted North American style pancakes covered in such a delicacy as maple syrup. We had brought a small bottle of maple syrup with us which we shared with the students and taught them about where the syrup comes from and how it is harvested. Stacey crushed up chocolate bars and showed the students how to make pancakes. Chocolate chip pancakes with maple syrup was enjoyed by all. 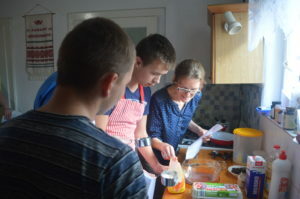 This past spring Stacey also began to organize an adult English club out of our home for our neighbors. Not just young students, but also many middle-aged people are interested in learning English. On a trip to the pharmacy one day, Stacey was approached by a local pharmacist about starting an English club in the village that could meet on a weekly basis. 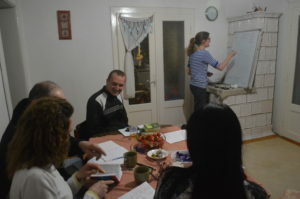 A dedicated group of neighbors came throughout the spring for evening English lessons from Stacey and it was a very good way to get in closer contact with our neighbors.